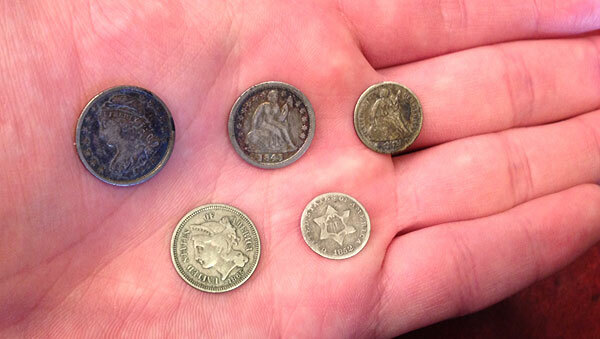 Oh man, I had a KILLER time last night meeting up with a fellow coin collector for a few hours. There’s nothing like chatting about coins over some warm coffee towards the end of the week, I’ll tell you what… Except for maybe then COMING HOME with some afterwards – what what! 1852 Three Cent “Trime” (silver) @ $20.00 (probably worth $27ish) The smallest of all U.S. silver coins! It’s teeny tiny – look at that pic of it in my hands down below! So three awesome odd denominations (two 3 cent pieces, and one 1/2 dime), one older dime I never owned (the “Capped Bust”) and then a much nicer “Seated Dime” that I already had, but in much worse condition. So that’ll now go into my “trading binder” to help get future coins down the road as to keep my main collection stocked with only my faves! It was hard to capture the true beauty of a couple of these, so played with the lighting to show my two favorites which have a nice rainbow toning going on in them – not rust which it kinda looked like at first glance to me (and probably in those above pics too). Look at that outer rim of rainbow! My first nicely toned coin! 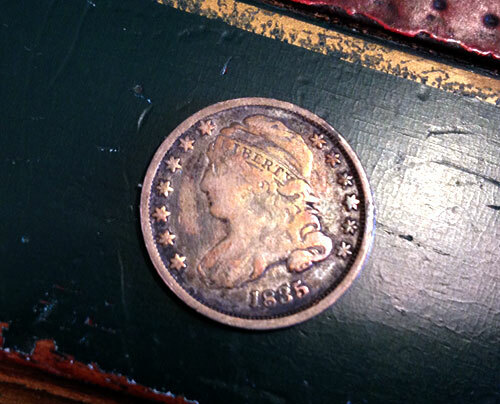 This one’s not *as* toned as the liberty dime, but it still a nice quality about it. At least to me (toning stuff is subjective). I didn’t take another pic of the reverse (back) mainly cuz it just wasn’t as nice as the obverse (front). But for $47 it’s kinda hard to complain :) The nicer gradings go well into the hundreds, and then into the lower thousands!! 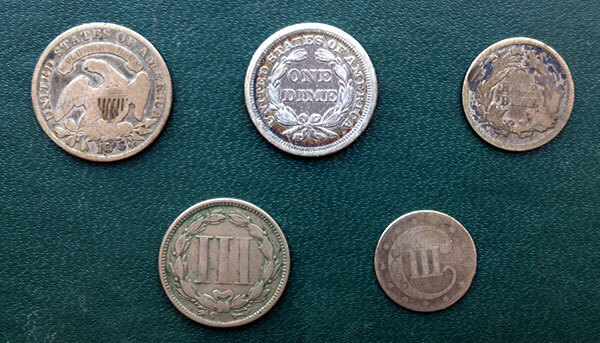 Look at that 1/2 dime (upper right) and trime! (lower right). Teeny tiny, and way smaller than our modern day dimes even… I should have placed one there actually, oh well. So there are my 5 new coins! 3 I’ve never owned before, and two others that are now upgraded. I’ve still got a ways to go on this upgrading strategy, but we do the best we can with what we’ve got, right? The fun is in all the wheelin’ and dealin’. Old Coins in a Tilt Arcade Game? Nice going, J$:) Your discoveries are my discoveries too, cuz I never heard of any of these beauties. What a fascinating way to learn history! 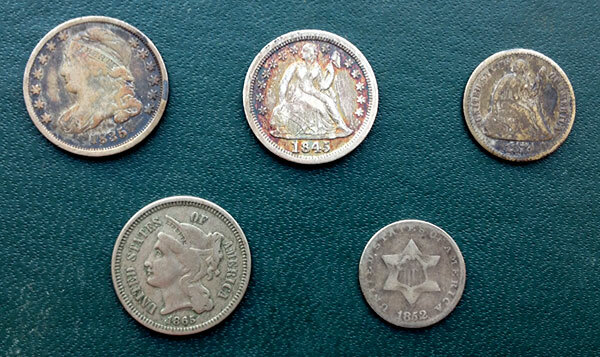 Hi sir, i have many rare coins .i want to sell them…how i do? Please reply me.